Super Peach's Castle of Fury is a Fawfulized version of Peach's Castle and the final giant boss that is fought in Mario & Luigi: Bowser's Inside Story and its 3DS remake. When Bowser follows the incomplete Dark Bowser out into the castle grounds, Dark Fawful arrives in front of Bowser, who gets annoyed. Dark Fawful then mentions how he needs more power. He also replies that Bowser's meddling has given him fury as large as the world, then taunts Bowser while saying "SUPER PEACH'S CASTLE OF FURY!". This commands the castle to transform into a towering machine, crushing Bowser. Afterwards, Mario, Luigi and Starlow go to the Rump Command and make Bowser giant again. He then fights the castle. Super Peach's Castle of Fury starts by creating a black hole that forms behind Bowser, thus making it so that he must beat the vacuuming force of the black hole every turn. Bowser must be sure not to get hit by any of the castle's attacks, as that will push him back and into the black hole. If Bowser does get trapped, he can slide the stylus to the right to careen into the castle, doing a good amount of damage. If this happens later in the fight, the castle will extend and retract it's spikes at regular intervals, forcing Bowser to time his swipe. If Bowser is not hit by the castle's attacks within a few turns, the castle will fire an unavoidable laser beam to force him into the hole. This also happens if Bowser does enough damage to the castle. After about 1/5 of the castle's health is depleted, the castle attempts to make another hole, but Bowser shoots a fireball at it, making the black hole go behind the castle instead, sucking it in. Bowser can punch the castle as it flies out of the void, which is the main way to damage the castle in this fight. Super Peach's Castle of Fury uses a variety of attacks throughout the battle. The first is to charge Bowser as he curls up, and push him into the void. Bowser must repeatedly slide a circle over and over until the castle is pushed back. Super Peach's Castle can extend his spikes at Bowser repeatedly, and Bowser must slide the stylus up each time the spikes extend to jump over them. 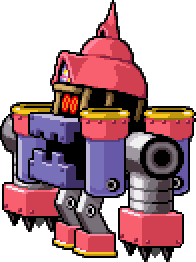 Another attack is when the castle shoots 2-4 missiles that each must be punched to be destroyed. The castle can create a horde of Mechawfuls that will ram into Bowser. He can deflect this by shooting fireballs at the green ones, which will destroy the yellow ones behind. If the castle creates a huge wave of Mechawfuls, Bowser can use fire breath on his next turn, which hurts the castle and the Mechawfuls. After every use of fire breath, the castle will overheat and may or may not drop a Mushroom. After 2/5 damage has been taken, the castle will activate a shield, making it immune to damage unless Bowser can push it into the black hole. After 3/5 health is depleted, the castle will bring both black holes closer, which leaves less room for error. If pushed into the void, it will also activate a "Boo protocol," which turns it invisible when it is flying out of the void. This forces Bowser to time his punch to be able to hit the castle. Both shield and invisibility last until the final phase of the fight. When the castle is at the brink of defeat, it brings both holes extremely close, trapping both Bowser and the castle. Bowser must repeatedly slam into the castle, timing his slams to avoid the spikes, to damage it before he loses too much health to the black hole. After enough slams, the holes disappear, and the castle is destroyed. Bowser can then enter the castle and face Dark Fawful. If Bowser is defeated by the hole, the hole will disappear with him in it, resulting in a Game Over. This page was last edited on April 16, 2019, at 10:06.